One way of thinking of Graveyard Marshal is that his ability makes each of your creatures be, in effect, two creatures. Granted, one of them is always a 2/2 zombie token, which may be less impressive in combat than whatever it was before, but that is less of a disadvantage than it looks when you consider that zombies have an awful lot of payoffs from various sets down the years. Liliana, Untouched by Death is merely the most currently expensive! This guy should be of some use even in non-tribal decks, and much stronger in anything that has access to zombie lords. Need a zombie army? Why not raise one yourself? Graveyard Marshall is one of those creatures that plays very well in both its tribe (Zombie) and on its own. Three mana lets you turn a dead creature into a 2/2 Zombie, triggering any number of “enters the battlefield” triggers…but what makes this more potent is that you don’t tap the Marshall to make a Zombie. If you have the creatures and the mana, you get the Zombies. 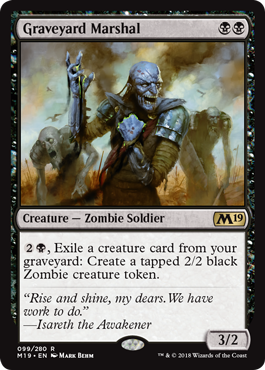 This naturally makes this a solid pairing with the infamous Death Baron, who empowers all of your undead forces rather nicely, and any of the other Zombie tribal enablers. Also, it’s a 3/2 for 2, which is a good bit ahead of curve. That’s remarkable! This guy is likely to be more powerful in Standard after The Scarab God leaves with Guilds of Ravnica, since there’s no reason to really prioritize this, but the promise of graveyard synergies with the upcoming sets and a potent effect makes this a nice bit player in any deck that can support him.